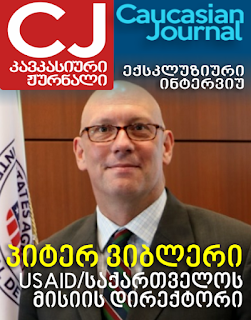 08.02.2017. (Almost) every week, I select an orange wine (a white wine made with extended skin contact) that grabbed my attention. Experienced wine lovers tend to look down on large producers – and by large, I mean wineries knocking out more than a million bottles a year. This isn’t without reason – generally, with such massive quantities, a different set of criteria apply – consistency, of both vintage and brand are of more concern than terroir or vintage variation. When it comes to winemaking, large producers tend to be more risk averse, more interested in reliability. Predictability is supposedly what the “average consumer” desires. Well, it is certainly what the “average buyer” desires. Which may or may not be the same thing. That said, if a major winery puts its might behind a concept, it can work very well. 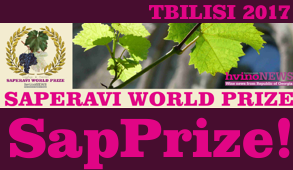 Tbilvino is based in east Georgia’s Kakheti – the country’s most important wine region. A product of the modern age, Tbilvino was conceived in a post-communist world – their first commercial vintage was 1999. 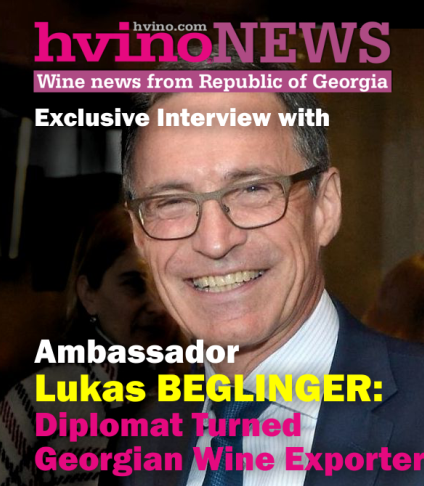 They’re pretty successful, producing around 3 million bottles a year, most of which are sold to Russia, other ex-Soviet countries and China – well established markets for Georgian wine. 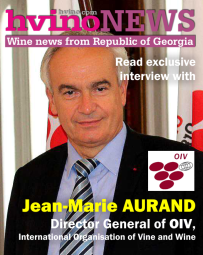 Tbilvino’s owners, brothers Zura and Giorgi Margvelashvili, noted the renewed interest in Georgia’s traditional qvevri wines. 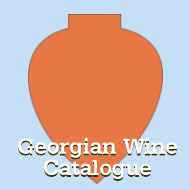 Since 2010 they market a small range of traditionally made wines, along side their more mainstream offerings. The “qvevris” range currently comprises a Rkatsiteli and a Saperavi, with a Kisi just about to be released. Tbilvino “Qvevris” Rkatsiteli has made it onto the shelves of Marks and Spencer at the bargain price of £10, in an M&S branded guise. It seems to go in and out of stock at the drop of a hat, so check availability before setting out on a fruitless journey. 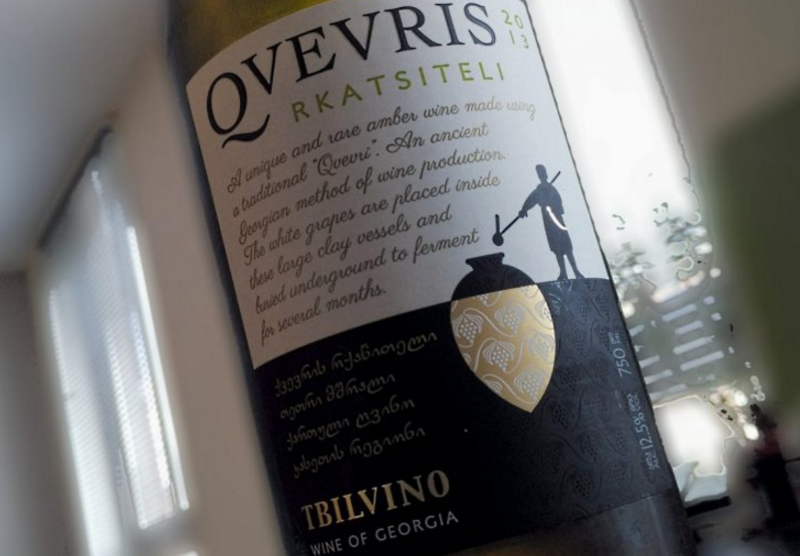 I’m not reviewing the Marks and Spencer version, but rather Tbilvino’s own label Qvevris Rkatsiteli 2013. The liquid in the bottle may well be the same, although M&S claims their bottling was specially selected. There’s a subtle floral note on the nose, not quite the jasmine aroma that I enjoy in some Rkatiselis, but more redolent of roses. Qvevri wines aren’t always that fruit-focused, but here we have really intense dried apricot, together with pleasing herbal, nutty overtones. The tannins are grippy, dry and dusty – but not overly dominant. For me this works really nicely to offset the ripeness of the fruit. In fact it makes me salivate and go back for another sip – surely the point. Some might claim this isn’t the full qvevri experience. 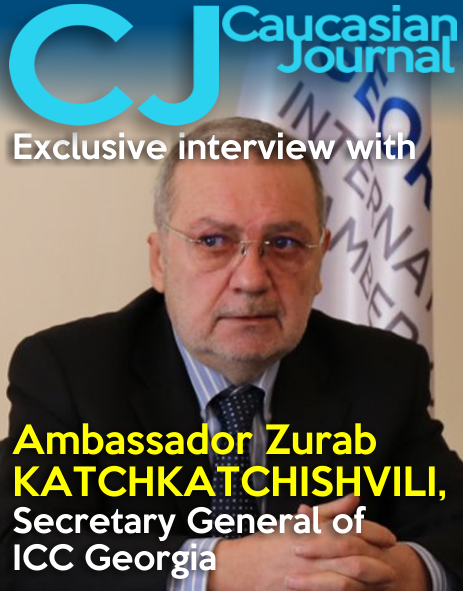 Yes, it may be ever so slightly “Kakheti-lite” – the wine spent two or three months in qvevri, rather than the traditional six. I don’t have precise information about whether stems were included (The Kakhetian tradition is to add them along with the skins), or how the wine was filtered, fined and sulphured, but neither do I care too deeply. Why? This is a wine with integrity, a wine that speaks of its grape variety and the region of production. It’s not overly dumbed down, manipulated or internationalised. Qvevris is a great introduction to the style. It’s tasty and costs barely over a tenner. However risk-averse you are, give it a go. Tbilvino Qvevris Rkatsiteli 2013 is available in the UK from Mephisto wines for £12.98, or in the Netherlands from Andere Wijn for €13. I was sent a media sample of this wine.